My recent trip to Hong Kong, the birthplace of wonton and wonton soup is a fruitful one. I have the advantage of having my siblings staying in Hong Kong and have the privilege to savor some of the best wontons in town. They also brought me to places only known to the locals to hunt for the exotic ingredients used by the top wonton chefs. Without a doubt, wonton has evolved from a street food snack into a culinary masterpiece. Nowadays, thousands of tourists visiting Hong Kong are flocking to the famed wontons stores hunting for the top-rated wontons and the soup. 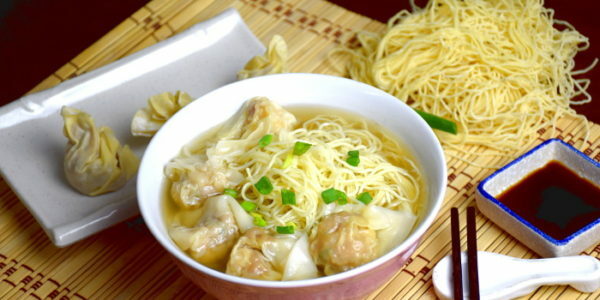 Although noodle is not the staple food, wonton noodles do have a unique emotional attachment to the Cantonese. Have a bowl of authentic wonton noodles back after an extended period away from home is satisfying. The word wonton is the transcription of the word 雲吞 Pronounced in Cantonese. These two Chinese characters are the corruption form of a more complex character 餛飩. 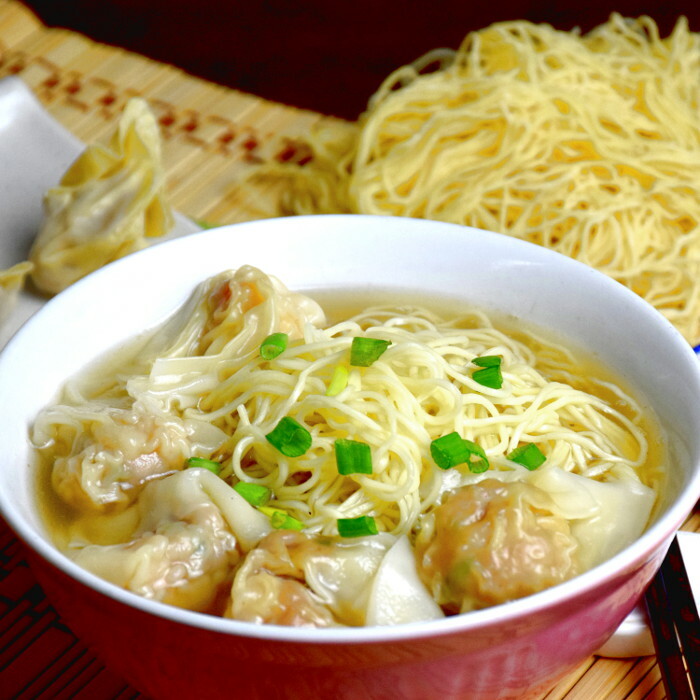 The history of wonton can trace back to the era of Western Han (206 BC – 9 AD). You can find the phrase Wonton 餛飩 in Fangyan 《方言》, the first Chinese dictionary of dialectal terms which was edit by the scholar Yang Xion 揚雄 in that era. Although wonton was originated in Northern China, it is the people in Guangzhou fine-tuning the recipe. The style and ingredients they used are similar to those we can find in Hong Kong. Cantonese wonton has become popular in many parts of the world. Wonton is a simple Chinese classic dumpling delight, served originally with noodle in soup but also as fried wonton. It has its mysteriously delicious Far East flavor that remind you of the old Shanghai and the post-World War 2 era in the bustling alleys of Hong Kong. Dried flounder is the best-kept secret of the authentic wonton. It is hard to get in countries other than China as this is exotic ingredients that are uncommon in other cuisines. I manage to get it in the powder form and the dry pieces at a specialized shop at Ap Lei Chau, a small island next to the Aberdeen harbor of Hong Kong. Ap Lei Chau is a fishing island. 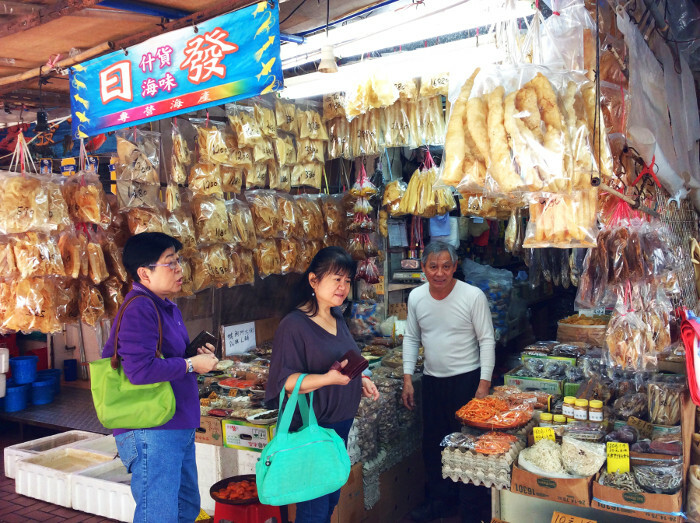 Many stores are selling seafood like dried scallop, abalones, dried squid and of course the dried flounder. Guangdong is the birthplace of Cantonese wonton noodle. After World War Two, the techniques of making wonton and the noodles have passed down to Cantonese migrant in Hong Kong. Since then, Hong Kong has produced the best wonton noodles in the world. Here are my top three choices of wonton noodle shop in Hong Kong. You should make a trip to visit these restaurants if you are there. They have been the gold standard for anyone to make a comparison of the quality of wonton, which I am trying to replicate the taste in the following recipe. Locate at Central of Hong Kong; this is the first noodle family business traced back to Mark’s first noodle house 池記 in Guangzhou in the 1930’s. During World War Two, Mak’s family migrated to Hong Kong and established a wonton shop in Central. The flavor is the culmination of the combination of the flavor of pork, shrimps, and fish. The soup is clean like consommé, but far richer. The springy noodles and tasty wontons had gained the recognition of the high ranking officials and social elites. They were called the King of Guangzhou Wonton noodles at that time. Mak’s noodle is now operated by the third generation of the Mak’s family and making the wontons and soups according to the well-guarded family recipe. Mak’s Noodle is considered the most established wonton restaurant in Hong Kong. Armed with the Michelin star, Ho Hung Kee was found seventy years ago by Mr. Ho, the disciple of the Mak’s family. This restaurant is the first wonton noodle house awarded a Michelin star back in 2012 and 2013. Ho Kung Kee’s traditional wonton had earned numerous accolades. The soup has a unique ingredient- dried flounder fish which render an exceptional flavor. I manage to get some dried flounder fish (and one in powder form) which will be part of the ingredients of my recipe. Wing Wah noodle shop is the favorable wonton shop of my mother for many years. Located in Wanchai, Hong Kong, the noodle soup is prepared with an open secret- shark bone. Gastronomes who patrons this shop will immediately recognize the difference in the flavor. Wing Wah serves wonton noodles prepared with the traditional method. The dough is made by kneading and pressing with a giant bamboo. You can observe how to prepare the noodle in the open kitchen right at the entrance. Wing Wah Noodle Shop has no other outlet. Being only one shop means they can maintain the quality of the wontons and noodles strictly. Armed with an arsenal of exotic ingredients, I am ready to take on the challenge to develop the wonton recipe to be on par or at least closest to the Michelin star masterpiece that I have tried. There will be a few recipe variations I intend to test, which I hope that it tastes great without these exotic ingredients. The best wontons should be enjoyed by everyone, anywhere without using the hard to find items. Nowadays there are many factories produce frozen wonton, but the quality is never come close to freshly made one. Making wonton is easy. All you need is ground pork, shrimps, ground pepper, eggs, and salt. 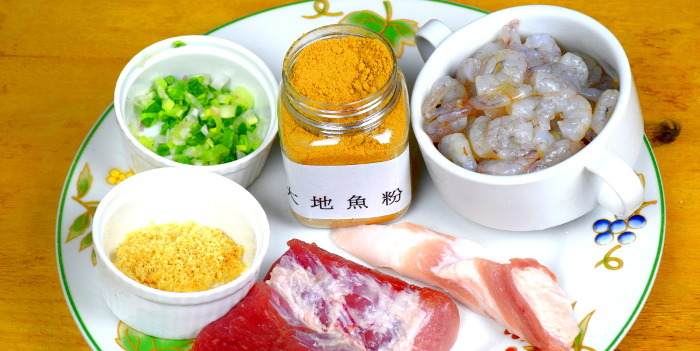 If you are serious about the quality, go ahead to add the flounder powder, dry shrimp powder, and scallion. Here is my wonton recipe after rounds of testing, and it is very close to the wontons available at Ho Hung Kee. The filling of wonton can be either pork, shrimp or both. I prefer my ‘golden formula’ with 40% lean pork, 10% pork fat and 50% fresh shrimps. The filling with a small portion of pork fat has a softer texture. Please read the following note before attempting to make the wonton. Your work becomes simpler and better with a clear understanding of how to do it correctly. 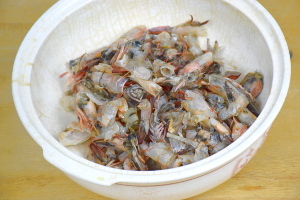 The purpose of soaking the shrimps with salt and baking soda and washed with running water is to make the shrimp crunchy. The crunchiness of the shrimp is crucial for good wontons. Mince the pork but keep the shrimp as the whole piece. ( If you use large shrimps, cut them into 2 or 3 parts). Unless you are making an enormous batch of wontons, the texture is a lot better if you mince the pork by hand. Of course, you can blend it in a food processor. However, it will turn out like a paste, and the wonton will lack the springy filling when you take a bite of it. The shrimps will lose the crunchiness if it is chopped or minced. The pinkish shrimp pieces can be seen right under the translucent wonton skin after cooking, which is aesthetically appealing. Since the shrimps are marinated with excess salt (for the purpose of crunchiness), be careful not to add too much salt to the pork. Some chefs prefer to use the whole shrimps to make shrimp wonton. It is similar to another Cantonese delicacy Har Gow (shrimp dumpling). Most of the established wonton shop prefer to use whole shrimp and sometimes accented by shiitake mushrooms, perhaps it looks expensive and can fetch a higher price. Yellow chives ay not be easily available outside Asia. You can use scallion as the substitution. Refrigerate the filling so that it is easier to handle while wrapping the wonton. Place the filling on the wonton skin. Fold diagonally and lightly press the filling. The wonton skin will adhere to the wet filling. 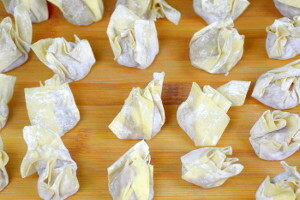 There is no need to use egg liquid to seal the wonton, as the egg inside the filling is sufficient to seal up the wonton. Leave part of the wonton skin to move freely to form a ‘tail.’ Only the wonton with a ‘ tale’ (call 金魚尾, the tail of goldfish by the Hong Kong chefs) formed by the wonton skin is considered the original. Add the wonton to a pot of boiling water over medium to high heat. Stir the wontons immediately with a pair of chopsticks or a ladle to prevent them from sticking together. The cooked wontons will float on the surface after two to three minutes. Remove them from the boiling water with a wire mesh strainer. Wonton can be frozen and keep in the freezer for up to a week. After wrapping the wonton, place a piece of baking paper on a large tray and arrange the wontons on it. Put the wonton in the freezer for a few hours until they are frozen. Remove the frozen wonton from the tray and pack them into a freezer-safe plastic container and cover tightly. When you want to cook the wonton, just cook the frozen wonton directly into the boiling water. You may need extra minutes to cook since they are frozen. The soup at the legendary Mak’s Noodles in Hong Kong includes unusual ingredients such as dried flounder and dried shrimp. 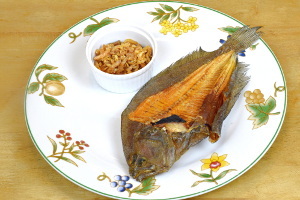 The soup is prepared by using pork bone, dried flounder, and shrimp shells. It is not by just throwing in a few ingredients to the ready-made chicken broth and call it wonton soup. I do understand it might be a tall order to get all these exotic ingredients. so here is my suggestion: use chicken back instead of pork bone and substitute the dried flounder with anchovies if it is not available. The ideal wonton soup is flavored with bones and seafood. The seafood, especially the dried type, will give a deep savory flavor to the broth. The wonton soup can also be made in advance and frozen in small portions. Just reheat and bring the soup to a boil, cook the wonton and noodles and you will have a warm, hearty meal in minutes. I have tasted many sub-quality wonton soups prepared by taking the shortcut. These are chicken stock added with soy sauce, sesame oil, ground pepper and perhaps simmer with some shrimp shells. Gastronomes will spot the short-cut version immediately without a doubt. This is the recipe for the Hong Kong style wonton soup, a far cry from the MSG loaded, one-dimensional version. Do take some time to make it. It takes three hours, but most of the time is passive cooking. Growing up with the Malaysian dry wonton noodles (wonton mee), I feel it is not complete without mentioning this local variant in this article. 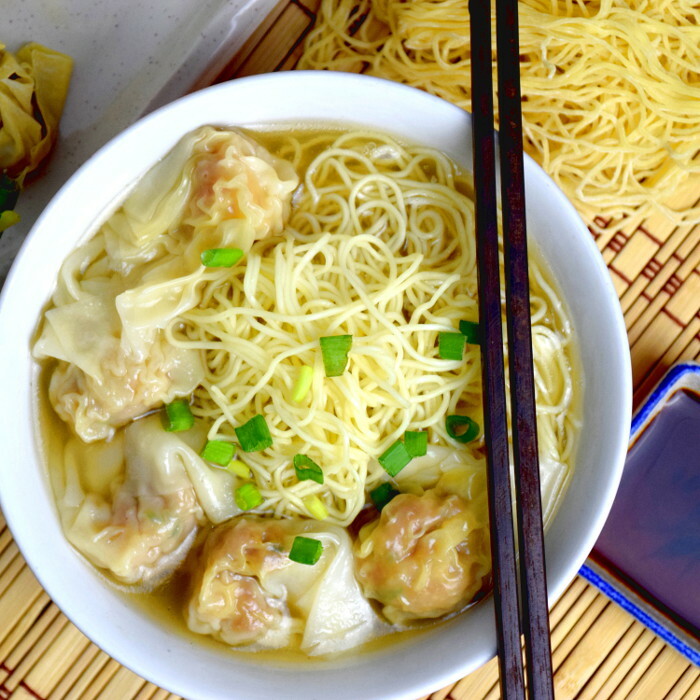 This wonton is served with soup in a small bowl, while the noodles are tossed with a thick, savory sauce and garlic oil/lard in a separate plate. Barbeque pork (Char Siu) and is the standard topping on the noodles, with a few stalks of blanched Choi sum to make it a complete meal. 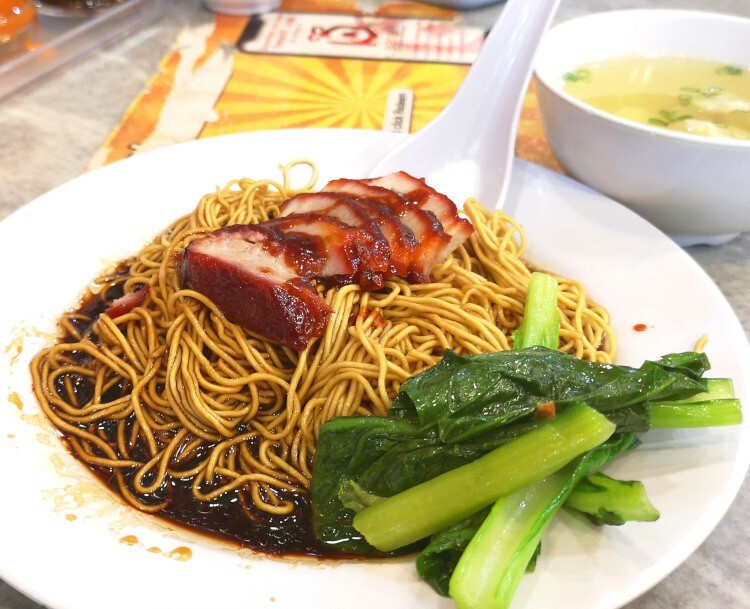 This noodles dish is the ubiquitous Malaysian Chinese variants that you must try. It is such a favorite meal that available in every Malaysian Chinese food court and hawker center. Make the noodle sauce by combining 1 tbsp of dark soy sauce, 1/2 tbsp of light soy sauce, one tsp of sesame oil, 1/8 tsp of salt and 1/2 tsp of sugar. Make the pickled green chilies. Slice 5 large green chilies thinly crosswise. Place them in a bowl and pour some boiling water into it. Let it sits for half a minute and drained. Combine 500ml of Chinese rice vinegar, 1/2 tsp of salt and 3 tbsp of sugar. Pour the mixture into the drained chilies. Keep in the refrigerator until the color of the chilies turns to olive green. Heat up 3 tbsp of vegetable oil over medium heat in a wok. Add 3 tbsp of minced garlic and saute over low heat until the garlic turn golden brown. Remove and set aside. To assemble. Cook 3 wontons and place in the soup in a bowl. Toss the blanched noodles with the thick sauce. Place on a plate and top with garlic oil of lard. Served with Char Siu and Choi Sum on top of the noodles. As for the wontons, there are some techniques to elevate the quality of the soup to the next level. Please read before boiling the soup. Blanch the pork ribs before simmering help to remove the clotted blood and impurities. They will leach out into the broth in the first few minutes of boiling. Therefore, blanching in a separate pot of water and scrubbing the bone before simmering it is an important step to producing a clean broth. Once the broth is boiling, reduce the heat to just enough to maintain the temperature at about 90°C. A good indication is when you see some small bubbles formed on the surface of the liquid. (The wonton chefs have a codeword for this, 'little shrimp eyes 蝦眼仔', as the bubbles resemble the eye of the shrimps). Boiling over high heat will cause the impurity from the bone to leak into the stock and make it murky. If you like wonton soup, you can make a larger batch and keep in the freezer. It will stay fresh for weeks. Divide the stock into a few portions so that you just need to defrost the amount you need. You can substitute the pork bones with the chicken bone. 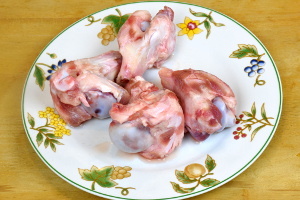 However, pork bones are widely used by traditional Chinese chefs. Dried flounder is available in some Asian specialty store. Although it is a specialty item that 's hard to get if you are not in Hong Kong or Southern China, it is is one of the best-kept secrets of the renowned wonton store in Hong Kong. Dry the fish under the sun, and then fry until it is completely dry, Then the fish is powdered. (Use dry anchovies as the substitutes are the next best thing). Remove the shrimp shell and deveined. Add a teaspoon of salt and 1/2 teaspoon of baking soda to the shrimps, soak for 15 minutes. Clean the shrimps under running water until the water becomes clear. Drain off the excess water and keep it dry by leaving it on a piece of kitchen paper. Combine all the ingredients until it becomes sticky. Keep it refrigerated for fifteen minutes before wrapping the wonton. Place the filling at the center of the wonton skin. Fold the two opposite corners of the skin together. Squeeze the wonton very lightly to let the skin adhere to the filling, leaving part of the wonton skin hanging freely. Blanch the pork bone in boiling water for five minutes. Removed and scrub clean. Fill the stockpot with cold water, put all the ingredients in the water. The level of water should just enough to submerge all the ingredients. Once the water is boiling, reduce to bare simmer for three hours. Skim away the scum floating on the surface from time to time. Strain through a wire mesh strainer to get a clear soup. Season with light soy sauce, salt, and ground white pepper. Making wonton wrappers and noodles are tedious. Even some wonton shops do not make the noodles and wrappers. You may just buy the ready-made one from the Asian grocery stores. Wonton wrappers are different from dumpling wrappers. They are square and thinner. Be sure you use the correct type for this recipe. 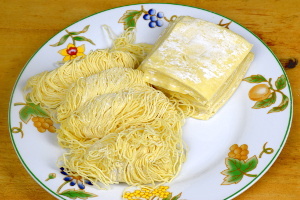 The noodle is made with duck eggs, pressed and knead with a unique method with a bamboo. This process can produce noodle that has a springy character, which is called bamboo noodles 竹升面. Fresh wonton noodles are the best, but the dried type is available widely. Wonton noodles are springy after cooking. People usually judge the quality of the noodles by related to how springy it is. Not all the Asian noodles are suitable for wonton noodles. Choose the one that is called dry egg noodles or the fresh one if available, or ask the noodles vendor which type is the most appropriate one. Here is the accepted method by all the famous wonton noodles shops in Hong Kong. 1. First, add a few drops of sesame oil and a teaspoon of soy sauce into a bowl. 2. Place the cooked wontons in the bowl. 3. Loosen the raw noodles and put it in a large pot of boiling water for about one minute, which by then the noodles should have three-quarter cooked. 4. Remove the noodles with a wire mesh strainer from the boiling water. Transfer the noodles immediately into a pot of cold water and soak for a few seconds. 5. Remove the noodles from the cold water and place it back to the boiling water for another ten seconds. 6. Add the wonton soup into the bowl filled with the wontons. 7. Place the noodles on top of the wontons. Part of the noodles should be above the surface of the soup. 8. Sprinkle with chopped scallions. You may ask: Doesn't it more appealing to reveal all the gorgeous looking wontons by putting it on top of the noodles? This arrangement of wontons, soup, and the noodles is called ‘laying the bowl with wontons 打碗底. The wonton should be placed at the bottom of the bowl, submerged in the steaming hot wonton soup to keep them warm. The noodle is added on top, and should only partially submerged, to avoid the nooeld from turning soggy. What about using cold water to soak the noodles? This method is called 过冷河 in Chinese, the codeword among the chefs loosely translated as ‘passing through the cold river.' Dipping the noodles in cold water can prevent the noodles from overcooked and maintain the springiness of the texture. 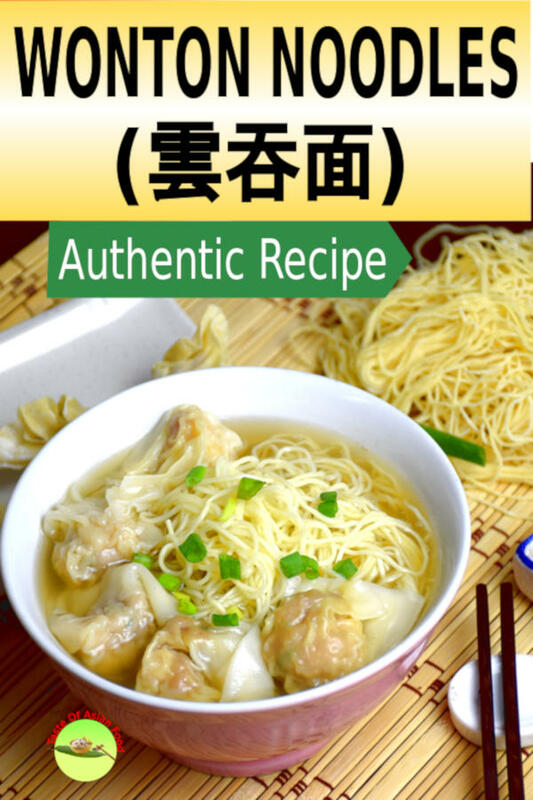 24 replies to "How to make the best wonton and wonton soup"
I discovered your site recently and I must say that I enjoyed reading and browsing your recipes. Would you post some vegetarian recipes in future? Certainly. That’s what I have in mind. After this wonton soup, I may work on some other food, and then will look into the vegetarian food. Thanks for joining me in cooking Asian food. Hello and thank you for taking the time to post your video on YouTube and for writing your experiences here in Hong Kong in search of this dish. I greatly appreciate your efforts and dedications. I am posting to let you know that one of your information is not correct. Guangzhou is not the birthplace of wanton. Wanton originated back in the Han Dynasty in China, as the legend go, not in Guangzhou. Guangzhou may be the birth place of wanton IN HONG KONG. All the same, thank you for sharing your video and information. Please keep up the good work. Thank you so much for pointing out the error. I have made the correction that it is the birthplace of Cantonese wonton. I also add a brief history of wonton in the intro section. It is wonderful to have people like you around that I will continue to maintain a high standard of whatever I post. KP Kwan – you are welcome. Happy to be of help. Good luck to your future ventures. KP Kwan – after posting my reply a few minutes ago (no way here to edit my post once it is submitted 🙁 ), I was wondering if there is such a thing as Cantonese Wanton ? I can’t see the difference in the wanton, for eg the stuff wherever they are made, they all use the usual common stuff, be it pork with shrimps or just pork, etc. So not sure if there is a difference between Cantonese wanton and say..Malaysian wanton. There is only a difference in the way of presenting the dish. For example, in Hong Kong, it is always presented with the noddle on top of the wanton and it is always in soup form. But in countries like Singapore and Malaysia, it could be presented without noodles, just wanton in a bowl of soup or there is the dry style where the noodles will be on a plate on its own with char siew or wanton on top of the noodles, with vegetables and some other garnishing over the noodles, but not in a soup. Perhpas it could be right (not sure if it is, though – historically. You have to check) to say that Guangzhou is the birth place/origin of wanton in HK and go about explaining how it got from Guangzhou to HK. ? Just a thought. Hope this helps if the info is correct. There are a few different style of wonton, in which the Hong Kong style is originated from Guangzhou. The past generation of the famed Mak’s Noodle was selling wonton there. I have not found an exact word ‘birthplace’ used in other references, so I have amended it to ensure the accuracy of the information. KP – thanks for your reply and the info. I have read your amendments and it is way much better. Good job ! Just one thing…you over looked to amend your very first opening line when you stated….Guangzhou, the birth place of wanton….
. Good luck and take care ! Keep up the good work in your YouTube video posts and the blog with lots of info here. Thank you very much and appreciate your comments. Thanks for your comment. I hope you like the wonton and give it a try. Could you please write the Chinese characters for “dried flounder powder”? I will visit Taipei soon and will search for this ingredient. But it would be good if I could show the correct characters. It is called 大地鱼粉. 鱼 means fish and 粉 means powder. This is what it is called when I bought it to make Wonton in Hong Kong. I understand that some places called it otherwise, such as 左口魚 / 比目鱼. Have a wonderful trip to Taiwan. Not a big difference, but this is the traditional writing of it used it Hong Kong. 大地魚粉. 大地 literally means “big earth”. But when searching markets in Hong Kong, they will usually just call it it 魚粉 ‘yu fun’ OR fish powder. I just found your detailed and informative website today from a Google search. I looked up Wing Wah Noodles–oh no, it closed in August! Cannot believe this! What a pity to the culinary world! As more and more of these traditional restaurants disappear and that no new generations join the profession, we will soon be left with processed food. In the US and Germany, a lot of restaurants/bakeries “cook”(in other words, just re-heat) their pre-processed, pre-mixed ingredients (loaded with chemicals) shipped from factories hundreds or thousands of miles away (even overseas) . Sadly, this is very common now. I am wondering if you could kindly make a recipe for stir-fried eggs and prawns (滑蛋蝦仁 or 蝦仁炒蛋) ? This is a staple dish that sounds simple but not easy to make well. I often order this dish at Cantonese style restaurants, but the eggs are often too dry or too hard. Thank you very much and please keep up with the good work! Thank you for your comment. My sister lives in Hong Kong, and I was told Wing Wah wonton noodles house is closed too. What a pity. I will keep 滑蛋蝦仁 in mind for the future recipe development. I do have a few others on the list, so this will be likely to take a little while for me to test and write. I have a question about the 150g of cleaned shrimp shells. Is this the weight of the actual shells themselves or is this the weight of the shrimp from which you take the shells from? I assume this is the weight of the shells but that would take a lot of shrimp (almost 1000g) to get that much weight of shells. It would take me a long time to save up that amount of weight of shells alone. Is there a place where one can buy just shrimp shells? The weight I refer to is the shell only. It indeed takes a long time to gather all the shells. I can get the shrimp vendor at the local wet market to sell the shell only to me, but I can understand it may not be the case in other places. You may want to add some dry anchovies to the stock if there aren’t enough shells. The recipe is authentic on from Hong Kong, and the dry flounder can be purchased easily. I have difficulty to get that oo in Malaysia, where I live now, so many restaurants have some changes by using anchovies. Hope this information is useful to you. 1. May I check for the soup, whether do you wash the dried flounder then dry it before putting into the oil to fry? 2. If i replace the dried flounder with dried anchovies, will the taste be the same? 3. For Flounder powder on the wantan, What other uses as it sold in a big packet. Can i add into the soup so that I don’t have the use the whole dried flounder? 1. I got dried flounder in Hong Kong. Forget to ask the vendor if it is already fried, but it is completely dry. So I add directly to the soup. 2. You can use anchovies, just like most of the Malaysian use (where I live) as it is very hard to get dried flounder. It tastes good but not entirely the same. 3. You can use the powder to season any clear Chinese soup and Chinese soup noodles.